A 3.25 x 3.5 square cornered full color school magnet welcoming students in the new academic year will be a welcome sight. 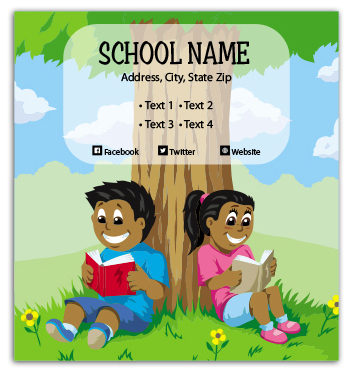 This magnet can be suitably customized with business information against the payment of $0.16. This magnet can be purchased at slashed rates when purchased in bulk. The advertisers can offer it as an indoor magnet and when offered as an outdoor magnet, it is supported with UV resistant coating. Product Size: 3.25 in. x 3.5 in.